The gift items were a success! Thanks so much for your help and assistance and the items arrived just in time. Thanks again! These were the perfect size and the personalized labels matched the wedding theme and style perfectly. We even enjoyed applying the labels assembly-line style. They are useful and priced right. These are cute but way too small. I am trying to even figure out how to use as giveaways. My customization is barely readable. Loved this lip balm. Perfect for my daughters sweet sixteen party favors. Great price. 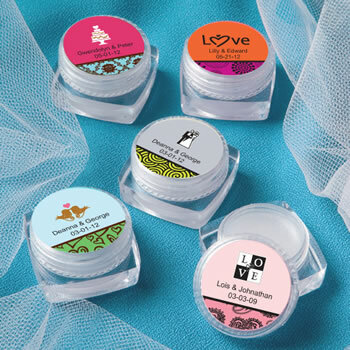 Love the lip balm wedding favors I just purchased. Able to match wedding colors and this is practical, people! Great value all around! I got exactly what I expected to receive which was awesome. I was hesitant at first because the price was so good but the product is excellent, even better than I anticipated. I would definitely order again in the future. Oh, and shipping speed was fantastic! It came earlier than they even estimated. Overall, very impressed. Not worth going with different designs since you are charged more. You will get stickers and need to assemble yourself. Very plain jane.. I had to buy a little accessory to stick on them so it didn't look so cheap. If you have a good printer save your money. This was a nice addition to our favor bags. It was fun to have something personalized in the bags! The lip balms were VERY SMALL. Not to mention, the lids were nothing more than stickers that it looked like someone printed out on their home computer. Then you are responsible for sticking them all. Not a big deal, but you could definitely make them yourself for probably half the price. From NicePriceFavors: Regarding the labels, we charge $0.03 for the labels vs the plain version of the lip balms you ordered, which means you spent $2.10 for the labels. I'm guessing that counting the cost of the labels, as well as the time to design and print them, that $2.10 is a pretty good bargain vs printing them on your home computer. That being said, we do sell these plain as well, so we leave it up to you whether you want us to print them for you or you want to "do it yourself." I ordered these as tokens of appreciation for my attendees at a baby shower. It was simple to order and personalize them. My guests were pleased and the balm works well. It's a neat gift to give to the girls! I did have to place the labels on the tops but I completed that I little time. Absolutely wonderful. They arrived in just days. Just what I was looking for, these lip balms made the perfect favor for my sister's baby shower. Great customer service and fast shipping. So I got these for a wedding shower favor, and they were a hit! They were about $1 a piece with shipping (I did the cheapest ground shipping) and they came 2 days earlier than what they recommended, awesome! But the background color was a darker aqua than it looked on my screen, otherwise I would've gave them a 5 review. I would def order these again! I ordered these for a bridal shower favor and they turned out really cute! They arrived very quickly and were a hit! I would definitely recommend them. We ordered these for our women's conference brunch party favors. The design was perfect except for the size of the font - I just didn't know it was going to be so small it was hard to read! The vanilla scent was yummy, though!